one of Stockholm’s most famous streets, are beautiful and varied. As we walked next to the water, my father pointed at a boat. I scoffed at this. Then when I got home I read an article about the ship we had discussed. 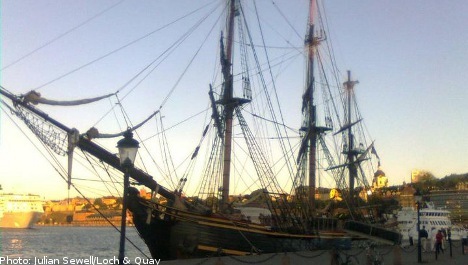 Turns out, not only is it a visitor to Stockholm, it actually is a pirate ship – it starred in Pirates of the Carribean. It has also been in Mutiny on the Bounty and Treasure Island. So we have a celebrity next door. Also, while I’m on the topic of celebrities and Pirates, Stellan Skarsgard was in the US Embassy the other day. Jatte cool. A few months ago, the American version of Girl with the Dragon Tattoo filmed a couple of scenes in and around my apartment building. My dad and I snapped a few photos of the set before being asked to stop because we were in the scene. It was pretty cool to watch and listen; I had never managed to get to a real film set during my four years in LA – and I’m a fan of David Fincher (Fight Club, Social Network, Benjamin Button). My mother found a credit card on the street today.